Is Biblical Authority relevant? Did God create the world in six twenty-four hour days? Did Jesus literally rise from the dead? Is God in control? Will we answer for how we lived our lives someday? And does any of this really matter? 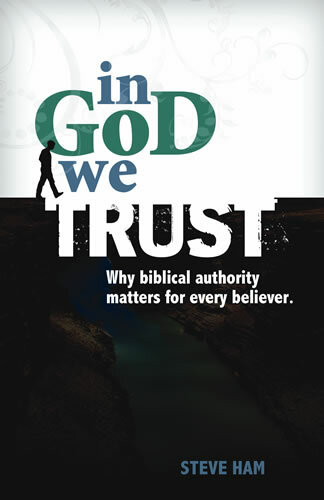 If you’ve ever struggled with such questions then Steve Ham’s new book, In God We Trust, Why Biblical Authority Matters for Every Believer, is for you. Ham is Senior Director of Outreach for Answers in Genesis (a non-profit apologetics ministry) and has no qualms regarding his devout belief in and respect for the authority of God. The book is separated into 3 sections. The first expounds the substance of authority; while the other sections highlight the authority of the Trinity and the authority in Christian practices including worship and the Christian home. Ham calls out the Christian family to take back our nation by being the husbands, fathers, wives and mothers that the Lord has called us to be. Throughout the book, Ham declares the difference between opinion, theory, and the word that defines the entire book – authority. Excellent quotes are sprinkled throughout the book. A few of my favorites follow. I’m thankful for people like Steve Ham who aren’t afraid to defend the authority on which we place our lives, love, and salvation and I’m glad that I had the opportunity to review this book. I hope you’ll take the time to sit down with it and consider how important the subject of authority actually is. Buy Ham’s book on Amazon by clicking here. A copy of In God We Trust was made available to me by New Leaf Publishing Group in return for a review. Entry Filed under: book review,In God We Trust. Posted in book review ,In God We Trust . Paula, our authority is Jesus, not a particular interpretation of Genesis. Sounds like an awesome book, I love the Answers in Genesis site, spent many an hour there over the years.